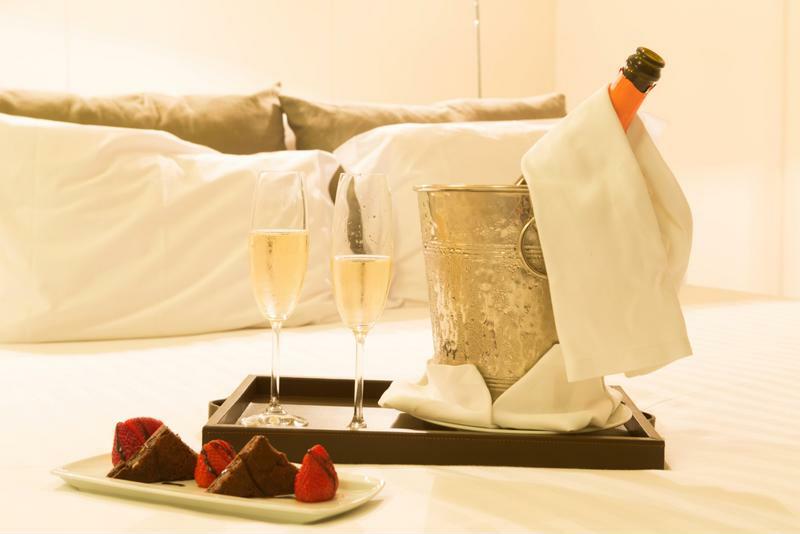 Champagne or sparkling wine can be a great romantic beverage to enjoy with your spouse, significant other or close friend on Valentine's Day. But why not try to switch it up and make something a little more exciting? Consider using sparking wine to craft a unique cocktail this Feb. 14. The classic orange juice and champagne works great for any brunch or breakfast, but for Valentine's Day, make a change for a pinker drink. Use chilled ruby red grapefruit juice and champagne or sparkling wine for a cocktail at any time of the day. Try adding a splash of ice-cold, citrus-flavored vodka as well for an extra kick. Serve in a champagne flute. Use champagne cocktails as the centerpiece of your Valentine's Day celebration. The most famous champagne drink is aptly named the "Classic Champagne Cocktail." It's a favorite at cocktail parties and bars, and is made with a mix of champagne, angostura bitters and sugar, often garnished with a citrus twist. While this cocktail may be a V-Day treat on its own, it's even better frozen. Use your frozen concoction maker to turn this classic into slush. Mix your champagne or sparkling wine with a few dashes of bitters and a couple of scoops of sugar. Fill the ice hopper and blend until you have a frothy, frozen cocktail. Pour it in a flute or margarita glass, garnish with a lemon or orange twist, and even add a splash of juice for extra flavor. Then serve to your loved one and enjoy! "Pull out your champagne flute and pour in about 1/3 shot of cognac. Then add a splash of Grand Marnier and fill the rest of the glass with champagne or sparkling wine - most people opt for brut." While this cocktail is more often thought of with New Year's Eve, it can be just as perfect on Valentine's Day. Pull out your champagne flute and pour in about 1/3 shot of cognac. Then add a splash of Grand Marnier and fill the rest of the glass with champagne or sparkling wine - most people opt for brut. Garnish with strawberries, raspberries or an orange wedge. Although it's a bit stronger than straight champagne, it keeps the light taste and feel that simple bubbly does. Like many simple drinks, bellinis have plenty of variations. While the standard version is usually made with prosecco - an Italian sparkling wine - and peach puree or juice, you can easily take this formula and adapt it to your preferences. You can use champagne or prosecco, but champagne can be expensive and carry an overpowering flavor. If you want to really taste the fruit, go Italian. If you prefer the bubbly, try French. You don't need to stick to peach flavors. Try other fruit purees, like raspberry, strawberry, melon or even orange. Consider using your own blender to whip up quick, homemade purees for a truly homemade bellini.